Given the exceptionally small size of Israel—roughly equivalent to the land mass of America’s State of New Jersey—the heretofore scarcity of natural resources that supply power and fuel for Israelis (and Palestinians) and the dependence upon foreign countries for these resources, who would ever imagine an Antitrust action against an Israeli company in a nation of some 8 million citizens (roughly six million Jewish Israelis, two million Arab Israelis). “This is what the Sovereign Lord says: At that time evil thoughts will come to your mind, and you will devise a wicked scheme. You will say, ‘Israel is an unprotected land filled with unwalled villages! I will march against her and destroy these people who live in such confidence! I will go to those formerly desolate cities that are now filled with people who have returned from exile in many nations. I will capture vast amounts of plunder, for the people are rich with livestock and other possessions now. They think the whole world revolves around them!” (Ezekiel 38:10-12). Let’s first look at what this antitrust action in Israel is all about, which also includes a large United States company; then place it in the context of the Gog-Magog assault against Israel, which is shaping up to be all the more imminent … things are falling into place on almost a daily basis. Noble Energy, headquartered in Houston, also discovered Israel’s first offshore crude oil reserve, called Mari-B. The article goes on to say that David Gilo met with attorneys for the two companies to inform them that both the Delek Group and Noble Energy would have to sell the majority of their holdings in Leviathan. Note: It’s curious that an industrial enterprise in Israel and a foreign (to Israel) companion company in Texas, would be taken to task over offshore (natural) gas drilling when they are merely trying to compete with world monopolies, like the Arab Cartel—to find and give Israel, surrounding countries such as Jordan and Egypt, and even the United States another source of fuel. But I suppose that is the positive nature (as long as it’s within reason) of a democracy, i.e. to publicly oversee and regulate industries that might otherwise become a monopoly. And Israel is the only democratic (a parliamentary representative union of at least ten political parties) nation in the Middle East. Not so with the Arab Cartel that is the single largest monopoly in the world. They come and go as they please; they supply much of the world’s crude oil/gas and charge what they will. It is through recent increases in America’s production of gas and oil like the shale oil reserves in North Dakota; and what could be Israel’s contribution to the global fuel supply that self-regulates energy prices, through free market enterprise and competition. (I’m convinced that the Israeli company and its Texas affiliate will be able to overcome this temporary setback). In ancient literature and oral tradition, and as occasionally referenced in Scripture, Leviathan was a large mythical sea creature or even a real-life behemoth that was virtually indestructible by man or nature or anything except God himself. Not unlike the modern-day Loch Ness Monster legend. The prophet Isaiah refers to this monstrosity by its name, and what will happen to it in the last days, telling us that, “In that day the Lord will take his terrible, swift sword and punish Leviathan … He will kill the dragon of the sea” (Isaiah 27:1). Whether this creature actually existed is not the issue; rather the emphasis is on its symbolical representation (depicted in ancient Aramaic literature as a seven-headed monster) of all that opposes God. From Ezekiel and other prophets we learn that this opposition will be a Satanic led coalition of nations as presented in the Gog/Magog invasion and subsequently in the ten-nation confederation that gives itself wholly to the Antichrist. The emphasis in the symbolism of Leviathan is that of: ENORMOUS. I’m certain the name of this natural gas field was chosen with the idea of sheer size; however, in light of the Bible’s negative allusion and connotation to this ancient creature that will represent modern-day alliances against Israel, I question the owner’s choice of Leviathan! On the other hand, it is an extraordinary correlation to Biblical prophecy. Although there will be any number of nations aligned with Russia (the passage also states “many others”), there are seven specific names of nations or regions specified in the Gog/Magog prophecy of Ezekiel: Meshech, Tubal, Persia, Ethiopia, Libya, Gomer, and Beth-togarmah. There is an eighth, but that is essentially the head of this coalition, which is Gog or the Prince of Rosh (Russia). Or if a scholar insists on eight nations identified, the imagery still fits with Leviathan which has seven heads but is also an eighth, which is the composite beast itself. Though a totally different beast for a different event, the imagery is remarkably identical to the seven-headed beast of Revelation 17, which represents seven kings and also an eighth king which comes out of and is one of the seven heads (kings). The eighth king is none other than the beast of Revelation, the Antichrist. Thus, the (seven-headed) Leviathan mentioned by Isaiah and other passages of Scripture embodies the two massive coalitions against Israel that will take place after the Rapture … Gog/Magog fairly soon afterward and the Antichrist beast near the end of the Great Tribulation. The mammoth natural gas field dubbed Leviathan is one of four main offshore finds by the Delek Group and Noble Energy after several years spent and some six billion dollars invested. 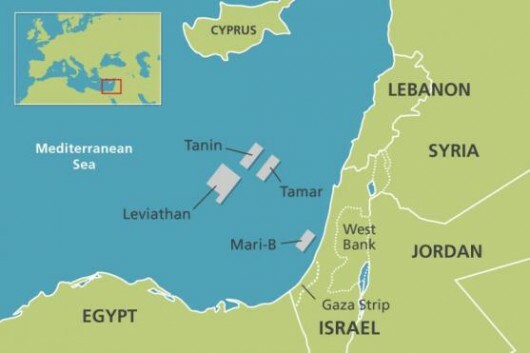 Leviathan was discovered in 2010 some 80 miles west of Haifa, Israel and contains an estimated 22 trillion cubic feet of natural gas. The other discoveries named Tamar (about 50 miles west of Haifa), and Tanin and Kadesh—often referred together due to their close proximity to each other, some 74 miles from Haifa— hold an estimated 8.4 trillion cubic feet and 1.3 trillion cubic feet, respectively. Thus, the Leviathan reservoir holds nearly three times the natural gas of the other three offshore sites combined. The Delek Group and subsidiaries control fifty-three per cent of the offshore ventures, with Noble Energy comprising the remaining forty-seven per cent. This article is not about debating the pros and cons of whether these two companies have created a monopoly; although no other companies have invested anywhere near the six billion exploration dollars to find these huge natural gas fields. Moreover, they are separate entities with each company independently owned, one from the other. They are not subsidiaries, one of the other. From my limited understanding of monopolies; that, in itself, creates a healthy check and balance system. The discovery of these gas fields off the coast of Israel is nothing short of amazing. For several reasons, two of which are: (1) Proceeds from the sale and distribution of these natural gas fields could increase Israel’s Gross Domestic Product (GDP) substantially. In the eyes of global economic powers including the Arab Cartel, it could level the playing field to the extent that Israel would become self-sufficient in natural gas consumption while cutting into the proceeds of surrounding Arab countries. It could change the financial dynamics of the entire Middle East, by making Israel a major player in the competitive field of energy production. (2) It provides and confirms the Biblically predicted incentive for Russia and select Russian allies to launch a colossal campaign against Israel as found in Ezekiel’s prophecy. Before discovering and developing these natural gas holdings, Israel offered a variety of exports to maintain a favorable trade surplus, but nothing like what these natural gas fields could accomplish. And, thereby, attract the attention of other nations, both friend and foe. Currently, Israel’s main export products include: Cut diamonds (already mined elsewhere), pearls, and other precious metals (31% of Israel’s exports); electrical machinery/equipment, appliances, sound & TV recorders, computer equipment (18%); pharmaceutical & fertilizer products (13%). Much of Israel’s non-tangible goods income is derived from tourism, but that is not an export, as such. Yet none of these products and certainly not tourism would generate nearly enough appeal for Russia to risk an invasion of Israel. But, now, with these gas fields, Russia has an ultra-strong motive to take over Israel … more natural gas! Despite the fact that six of the twelve largest natural gas holdings in the entire world are found in Russia which boasts 17% of the world’s natural gas reserves (under, incidentally a conglomerate called GasProm which is a real-life monopoly … producing 83% of Russia’s natural gas), Russia lost some of her oil/gas reserves to the now sovereign nation of Turkmenistan and other former Soviet Union satellite countries. Plus, western coalition sanctions against Russia for her illegal activities in Ukraine have begun to exact a heavy toll on the Russian economy. But even before those sanctions, Russia was not faring well with its relatively new capitalism slash socialism regime. The Russian Bear needs and wants all the energy reserves it can get … whatever it has is not enough to satisfy its ravenous appetite for domestic and export fuel. Leviathan was the world’s largest offshore discovery (2010) since around the year 2000. Combined with the other three fields in the same general vicinity of the Mediterranean Sea, what nation wouldn’t covet such a splendid fountain of wealth? Putting this into perspective, however, Russia produced approximately 18 trillion cubic feet of natural gas in 2011 alone. Theoretically, the Israeli gas fields would (if Russia were in control of them) provide only 1-3 years supply, but that’s only if Russia had the capacity to extract the gas to the same extent it has in its own country. Which it undoubtedly wouldn’t; because men and equipment are limited on an offshore rig. Thus, Leviathan would be a supplementary source of natural gas for years to come, even for Russia. Which leads to a secondary but equally significant motive for Russia to overrun Israel with Muslim countries in tow: First, take Israel. Second, take over your Arab or Persian allies and their oil and gas fields! It’s a classic historical paradigm in which a strong country sometimes will turn on its confederates, after the ally helped the host country defeat its enemies and/or after a treaty was signed. In fact, that’s exactly what will happen between Russia and her allies (read all of Ezekiel 38 & 39); only they will turn on each other BEFORE they accomplish their diabolical objective. They won’t know until it’s too late, but the Gog/Magog campaign will be: Mission Impossible! But not until they utterly terrify Israel with one of the most massive invasions ever attempted. A Leviathan attack! Let’s read again what exactly it is that appeals to Russia enough to actually strike Israel. Listen to the boast of Prince Gog from the land of Magog to his cronies and against the true and living God: “I will go to those formerly desolate cities that are now filled with people who have returned from exile in many nations. I will capture vast amounts of plunder, for the people are rich with livestock and other possessions now….” (Ezekiel 38:12, italics for emphasis). First: As most know, the Jews have returned to Israel from exile in great numbers. This has been emphasized in several Eye of Prophecy articles as well as a myriad of other articles by both Biblical and secular scholars and journalists. Indeed, it is a matter of common knowledge to anyone who knows just a little about what’s happening in Israel and the Middle East. Second, what does Scripture say that Gog/Magog will covet in Israel? Livestock … perhaps literally but more so figuratively representing the prosperity of a nation. But even more so, Russia, Iran, and other nations in this evil, greedy confederation will crave a vast amount of gas and oil and other tangible goods that are by-products of hydrocarbon fuel … vast amounts of plunder, other possessions, including silver and gold purchased with the currency of such wealth. Until recently, Russia wouldn’t have thought twice about Israel’s possessions. In the past, Russian officials rarely said anything about Israel and certainly didn’t go out of their way to court Israel as an economic or political neighbor. However, they could always be counted on to vote in favor of whatever sanction of the day against Israel had been proposed by countries of the United Nations hostile toward Israel … of which there are many (most). By and large, however, Russia’s animosity toward Israel remained relatively silent and unobtrusive. Until now. In fact, the real humiliation is repeated defeat of Hamas and Hezbollah when they constantly force Israel to respond to hundreds of missile attacks, kidnappings of Israeli soldiers and civilians, and savage murders of Israelis—all of which are a matter of record. What oppression is Putin referring to? The Israelis evicted their own people from Gaza in 2005 and relocated them throughout Israel; furthermore, Israel has allowed both the Palestinian Authority in the West Bank and Hamas in Gaza Strip, respectively, to operate independently of Israeli administration. The only Israeli intervention or intrusion comes when its people are attacked, or sometimes in the form of a preemptive strike when Israel has well documented evidence of a looming assault on Jewish civilians and soldiers. Yet the height of irony, if not hypocrisy, is that Russian political and economic officials have been subtlety and secretly (as much as some things can be secretly suppressed) reaching out to Israel with proposals of mutual benefit to both countries, particularly economic benefits. Why is that? The consensus answer from political and economic experts seems to focus on only one factor: Russia’s keen growing interest in the vast gas and oil reserves recently discovered by Israel, especially the offshore findings! Behind the scenes overtures from Russia have apparently been significant enough for Israel to at least listen to these proposals (whatever they are), to the extent that Israel even refrained from condemning Russia (to the consternation of the United States and other Western allies) for its intervention in the Crimean crisis … which was and still is part of the Ukraine problem. In my opinion, whether Russia had approached Israel or not, Prime Minister Benjamin Netanyahu and his staff would have remained neutral on the Crimean conflict. However, the very idea that Russia has in a clandestine manner (while openly criticizing Israel with regard to the Palestinians) made certain gestures to gain Israel’s favor is, at the very least, intriguing. Yet Israel’s leaders are shrewd, in the sense of astute, discerning … but also crafty when necessary. I’m sure they have a purpose for listening to whatever propositions might help them continue with a strong and vibrant economy. Which brings us back to Ezekiel’s extraordinary prophecy of what exactly it is that will entice Russia and her Gog/Magog allies such as Iran (which only became bedfellows with Russia some two decades ago) to, as Putin said, “every step must be taken to eliminate the humiliation (of the Palestinians)…” followed by his equally brazen statement that Israeli settlements are, “a cause increasing tension in the Middle East.” Putin’s words of every step must be taken is the kind of language that prominent national leaders use and understand to include military options. Folks, this is another modern-day development that is unprecedented even for the 20th & 21st centuries, which have seen dozens of surprising developments, not the least of which is the return of Jews to their land, the land of Israel. Which is the first condition identified by Ezekiel; that not unless the Jews are back in the land will the last days or end-times Gog-Magog campaign begin. Most likely this alliance and invasion could be, probably will be, under the guise of protecting the Palestinian cause. With the ultimate purpose fully disclosed as they march to Israel, i.e. usurping control over Israel’s recently discovered natural fuel and mineral reserves, but also assuming authority over Arab oil fields by establishing a strategic military and economic foothold in the Middle East. I believe the evidence is compellingly clear: The plunder and acquisition of Israel’s “other possessions” as described by Ezekiel is none other than the coveted fields of fuel previously unknown to Israel or the world, discovered seemingly out of nowhere (in the Mediterranean Sea tens of miles from the coast of Israel) in a relatively short period of time (as oil and gas explorations go). Why else would Russia suddenly adopt a two-faced strategy with Israel? (1) Verbal sanctions against Israel relative to the Palestinian issue, by siding with world opinion. (2) A Machiavelli style solicitation of Israel’s favor in order to…. To what? I believe the answer is all too evident: To someday (soon) take what they really want from Israel—its natural gas deposits and its strategic geographical location in the Middle East. To further support the premise that Russia will launch a multi-national military campaign against Israel under the initial pretense of liberating the Palestinians, let’s read again Ezekiel’s words, this time concentrating on another phrase: “…I will capture vast amounts of plunder, for the people are rich with livestock and other possessions now. They think the whole world revolves around them!” (Ezekiel 38:12, italics for heavy emphasis). These type of accusations and this kind of irrational, unwarranted, inexplicable animosity toward the Jews is the underlying reason for and expression of Anti-Semitism especially in today’s world … stemming primarily from envy of what the Jews have accomplished down through the ages. All one need do is to read and listen to the continuous stream of condescending, haughty, self-centered, conceited, smug, vain, and threatening verbiage from Arab and Muslim nations, and even European leaders whose entire goal in life seems to be that of lashing, bashing, and thrashing Israel. None of these nations would do anything whatsoever to prevent (in fact some will join) the Magog alliance (and later the Antichrist and his coalition) from not just bashing Israel, but smashing her to pieces with the tail of Leviathan. So, once again, we see the breath-taking succession of events that have propelled us into the last of the last days as depicted by Scripture. If you like, please refer to many more details of the Gog-Magog invasion in prior Eye of Prophecy articles entitled, The Omega Generation (published 2-15-14); Beware of the Bear (3-22-14); Alliances Against Israel (9-20-14); and Russia Iran Versus Israel (10-4-14). I like how Myles Weiss, the host of the Zola Levitt television program and contributing editor of the Levitt Letter, puts it: Instead of the usual (but still applicable) phrase, Signs of the Times, Myles refers to the astonishing convergence of current events connecting to Biblical prophecy as: Times of the Signs! At the time that I clicked publish, and sent this blog article through cyberspace, the Rapture had not yet occurred. But that could change any day, any minute. When Jesus answered his disciple’s question, “…What sign will signal your return and the end of the world?” (Matthew 24:3); he gave a captivating list of indicators. During the course of this lengthy message, he said, “But all this is only the first of the birth pains, with more to come” (Matthew 24:8). Much of the more to come is already here, as elaborated by other passages of Scripture, and as confirmed by current events. The birth pangs are much closer together; the pain much sharper. The birth of the Day of the Lord (which begins with the Rapture) is at hand. Heed the words of Christ: “So when all these things begin to happen, stand and look up, for your salvation is near!” (Luke 21:28).